That doesn’t mean to say the Sony SBH70 is lacking in features, just on the contrary. Join me as I explore it in detail. 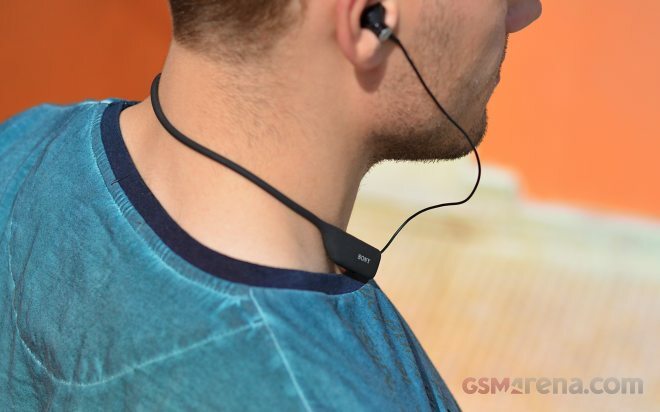 The Sony SBH70 is a flexible and lightweight Bluetooth headset with a behind-the-neck form factor. It uses a vented acoustical design much like the EarPods, which come with several of the past Apple iPhone generations. 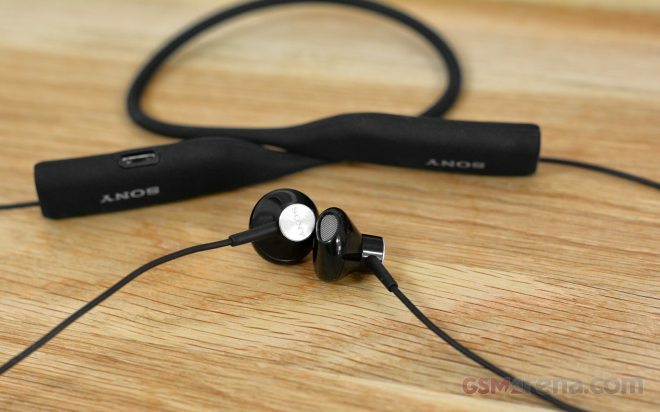 Sony’s earbuds however have a more premium feel than Apple’s as they are made out of metal. And of course, they’re wireless. 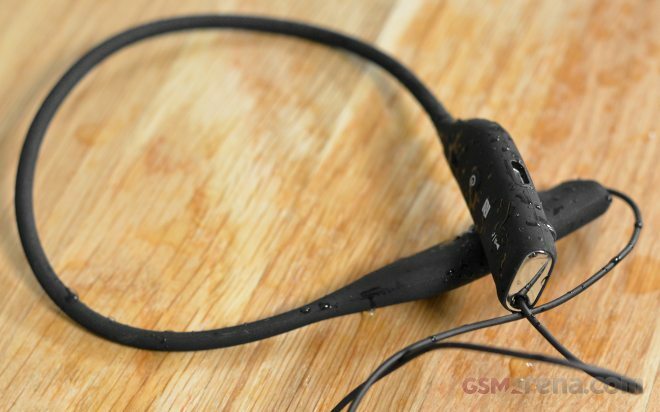 Probably the biggest selling feature of the Sony SBH70 however is its IP57 certification, which means the headset is practically waterproof (it should be good for an immersion up to 1m depth). It’s not rated for use under water, but using it in the rain, or even dropping it in a puddle of water, should pose no threat for the Sony SBH70. The retail box only offers a short microUSB charger cable and a quick user guide. Of course, you can always use any microUSB phone charger, so you will always have other options for topping up some juice. Honestly, you won’t need to look for an outlet that often as the Sony SBH70 offers pretty good battery life. Sony claims that the 125mAh battery inside the headset will deliver up to 6h of music streaming or up to 8.5 hours of talk time. That doesn’t sound like an awful lot but it easily got me through a week’s worth of commutes. My own LG HBS-800 Tone Ultra Bluetooth headset has a 195mAh battery and provides up to 10h of music streaming and up to 10h of talk time, which, proportionally, comes to about same power efficiency. Of course, the LG headset is also heavier and it doesn’t have any enhanced water resistance. Sony don’t state the version of the supported Bluetooth (2.1, 3 or 4) and also there is no sign of any aptX compatibility. Of course, the jury is still out on whether aptX delivers real-life improvements in Bluetooth streaming audio quality. Plus not all phones support aptX too – Apple has certainly been one manufacturer to shy away from supporting the standard. The headset does support NFC though, for quick pairing. It’s also got Multipoint support, meaning you can have several phones connected to it simultaneously. 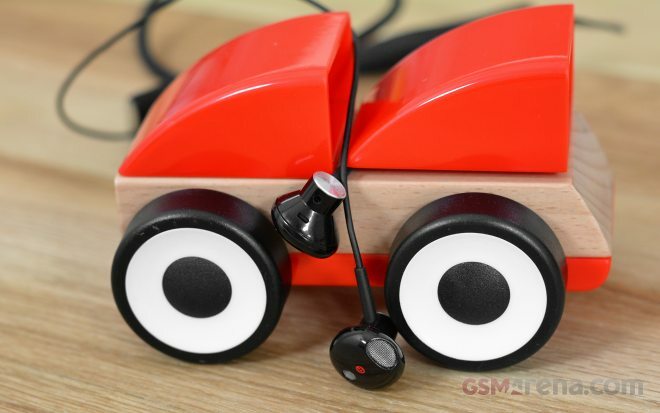 The headset notifies you of various events with mild vibrations – that includes turning it on and off, connecting to a phone, incoming calls and of course, battery low warnings. Some of these are also joined by a subtle tone playing in your ear and you quickly learn to recognize the reason for the alert. Besides the black version that I am reviewing, the Sony SBH70 is also available in blue, pink, white and yellow. All of these are some seriously flashy colors to hook on your neck so fashionistas would better choose wisely. The Sony SBH70 is a joy to use, and to even just touch really. The soft touch rubberized surface feels amazing. Its matte surface tends to pick dust and miniscule clothing threads more easily than glossy plastic, but it’s nothing major and I would still take this sort of finish over anything else. I didn’t get a chance to take the Sony SBH70 in the shower but I am more than sure that Sony has delivered on its water-proofing promise. Another positive point to make is that the earbud design allows them to sit nicely in the ear and they don’t fall off while running. With echo, wind and noise cancellation, you can bet the in-call sound quality provided by the Sony SBH70 was great. The other party was always able to hear me well while the headset was around my neck without me adjusting the position of my head in a specific direction. Sony advertises the headset to come with an HD Voice compliant mic so if your carrier supports HD Voice and the phones on the both ends of the call support it too, you can enjoy the same high quality audio experience through the Bluetooth headset itself (a rarity, really). As for music streaming sound quality, I am quite happy with the Sony SBH70. Highs are nice and clear and the bass is quite well balanced. In fact, I found the bass/treble balance to be better than on the Apple EarPods. Of course, bass levels can never match those provided by headsets which seal the ear channel like my LG HBS-800. Of course, the sealed ear channel design comes with its own set of drawbacks – decreased situational awareness, uneasy under-vacuum feeling, hearing your own breath unnaturally – which may not be to everyone’s taste. Sealed ear channel designs are a love it or hate it affair, so if you don’t like it, but you still prefer using earbuds rather than over the head headphones, the Sony SBH70 is one great choice. One thing to note is that the Sony SBH70 not as loud as either my LG HBS-800 or my Apple EarPods. I measured a maximum loudness of 96dB with my loudness meter, while the LG HBS-800 packed 105dB, which is noticeably louder. Not that it’s recommended to use music at this loudness level for prolonged times, but it’s nice to have that sort of power if you use it responsibly. Also listening to music at the maximum loudness level on the Sony SBH70 with less-than-top-quality sound tracks is not pleasing as you can hear the occasional clipping in the low section when the bass overwhelms the drivers. I was more than happy to use the Sony SBH70 in every possible aspect. The soft rubberized finish is amazing and everybody around me was impressed by the high quality feel it has. The metal earbuds help too and you’ve got a premium looking wireless headset for a rather affordable price. The Sony SBH70 offers great call quality and it’s quick to connect regardless of the make of phone you are using. The keys for operating the headset have excellent tactility and I got used to their positions quite fast. Sound quality during calls was amazing and care-free. I didn’t have to adjust my head in a specific direction and the other side always heard me loud and clear. The flexible design means that sometimes it would get tangled into some of the other stuff I carry in my bag, but that’s a minor annoyance. More importantly, I am really no fan of this earbud design as it lacks the punchy bass I am used to. The sound is better balanced than the Apple EarPods, which share the same design, so I am sure Sony has done its best tuning the sound quality. It’s a design limitation more than anything else. The lack of a battery level indicator is a letdown for me. Essentially, you wouldn’t know how much battery you have left in your headset until it runs out and the headset shuts itself off. I found that the maximum loudness that the headset delivers is sometimes not enough especially in loud environments. I doubt they would serve you well on an airplane, for instance, as my experience shows me that even the slightly louder Apple EarPods don’t manage to overcome the sound of the engines. The Sony SBH70 is an excellent headset and moreover for a price of €60/£45.59 it certainly deserves your consideration. And that’s without even mentioning ih has extra weather and water-proofing. For my commutes I still prefer an earbud design that seals the ear channel better thus providing a much better bass perception but this sort of thing is strictly a matter of personal preference. There is no right or wrong design; there are just different user needs. If you are after a Bluetooth headset that doesn’t seal the sound from the outside world, the Sony SBH70 is one seriously impressive product even if you are not using any other product by the brand.